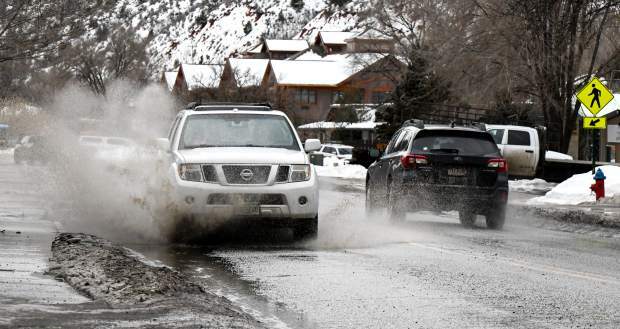 A car hits a large pothole and puddle on South Grand in South Glenwood Springs. 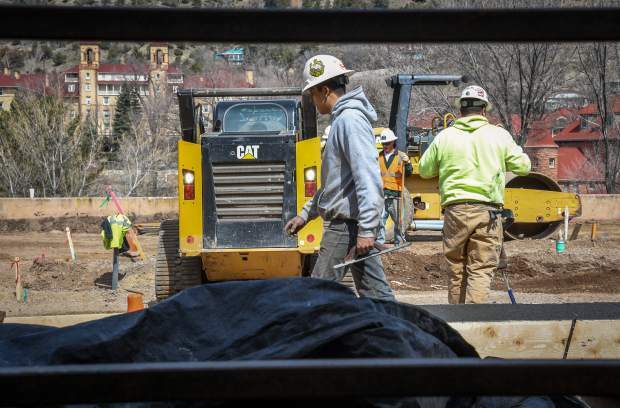 The Glenwood Springs Chamber Resort Association (GSCRA) and its ad hoc political committee Community on the Move will not get on board with the 0.75 percent street sales tax question headed to Glenwood voters as part of the upcoming municipal election. Ian Exelbert, chairman of the Chamber Board of Directors, penned in a recent statement to City Council stating that, “following additional consideration and discussion, and reflecting input from the business sector,” the city should reconsider whether the timing is right. The ballot proposal approved by council last month for the April 2 ballot called for a 0.75 percent new sales and use tax, with a 20-year sunset and bonding capacity, to fix city streets and infrastructure. “If the city proceeds with its current plans, the GSCRA will not oppose the effort, but cannot – in good faith and absent adequate time to participate in the process and prepare for a campaign – activate [Community on the Move] at this time,” Exelbert stated in the letter. Over the course of the last 30 years, Community on the Move, via political campaigns, has driven home numerous tax initiatives responsible for major city infrastructure needs and aesthetic improvements. As evidenced by a unanimous recommendation and subsequent vote in favor of the street sales tax, the Glenwood Springs Financial Advisory Board and City Council disagree with the chamber on the bumpy issue. “When I think about the role of municipal government and I think about our most fundamental role and fundamental responsibility, it is to ensure that our citizens have clean water, clean wastewater removal, safe streets,” Councilor and FAB liaison Jim Ingraham said Friday. The city already has a 0.5 percent sales tax intended to help maintain and rebuild the city’s streets, but many believe the amount it generates simply does not suffice. “We also have some serious issues with our water pipes and waste water pipes and putting those off, putting off addressing those fundamental responsibilities, to me is irresponsible on the part of city government,” Ingraham added. Councilors said at a January meeting that, should the ballot question pass, none of the revenue generated would go toward any project other than fixing the city’s streets and underlying infrastructure. Additionally, should the work see completion before the 20-year sunset, the tax would immediately cease to exist. 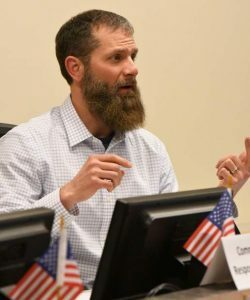 Councilor Jonathan Godes said that enough work has been done by the city’s engineering and streets departments, and by council and its advisory boards and commissions, “that we feel this is the time, now, to give voters an opportunity to weigh in. 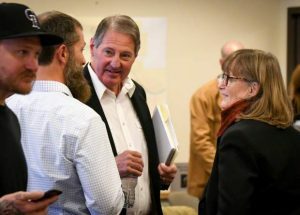 “As our streets are degrading, all of the time, and construction costs are rising at five percent annually a year, punting this two more years down the road to an uncertain political climate and an uncertain economic time just doesn’t make sense to me,” Godes said. 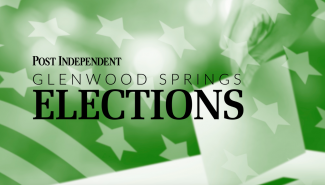 Glenwood Springs voters will get that opportunity as part of the April 2 municipal election, when four City Council seats are also up for election. Two of those races will be contested, between Ingraham and challengers Tony Hershey and Erika Gibson for an at-large seat, and between Charlie Willman, Jennifer Vanian and Ksana Oglesby for the open Ward 3 seat.